​Atlantic Records was the pioneering home of Ray Charles, Crosby, Stills, Nash and Young, Otis Redding, Led Zeppelin, Cream, Roberta Flack, John Coltrane, and scores of other great Jazz, R&B and Pop artists. The Coasters, The Drifters, Ruth Brown, Ray Charles, Solomon Burke, Otis Redding, Sam & Dave, Wilson Pickett head the list of African-American stars that the label marketed during the 1950s and 1960s. Aretha Franklin had originally been signed to Columbia Records by John Hammond, who also signed Billie Holiday, Count Basie, Bob Dylan, and Bruce Springsteen. When her Columbia career failed to ignite, Atlantic Records signed her, and under the guidance of Jerry Wexler, Franklin’s career was transformed. Starting in 1967, her string of hits – “I Never Loved A Man”, “Respect”, “Baby I Love You”, “Chain of Fools”, “Think”, “Don’t Play That Song” – kept Atlantic Records at the top of both the Pop and R&B charts. Franklin’s success disguised the fact that the label was losing touch with its R&B heritage following the death of Otis Redding and Ray Charles’ defection to a rival company. Love of Soul Music, from the Supremes to Al Green, had united Americans across racial lines. However, by the early 1970s, the Civil Rights movement had fractured coupled with the assassinations of Martin Luther King and Malcolm X. This led to the growth of the Black Power movement and a growing alienation of African Americans – and their music – from the white mainstream culture. Labels, like Atlantic Records (which became part of Warner Communications by 1970), saw their future more and more in the exploding market for white rock groups and singer-songwriters. 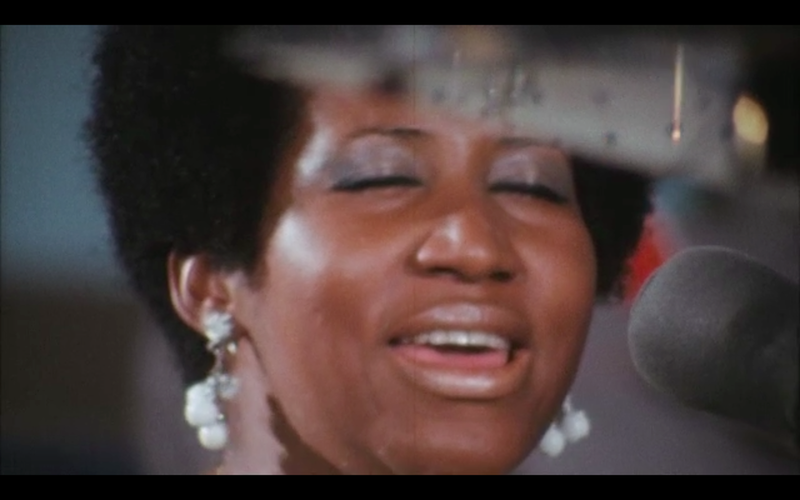 By 1971, Aretha Franklin was known as the Queen of Soul. In the culmination of five years of chart-topping hits, she and her producer, Jerry Wexler of Atlantic Records, decided her next recording would take her back to the music of her youth, to the world of American Gospel music. Amazing Grace was not intended as a swan song, but it would turn out to be an elegiac moment in American musical history as well as a salute to the gospel heritage that had transformed American music in the 1960s. Sydney Pollack was a feature-film director. When recording, sound is usually post-synched on the back-lot. After the remarkable two days of recording, the editors threw up their hands. There were no clappers, no marks to guide the sound into synch with the picture. Pollack hired lip readers and specialist editors but received no luck. 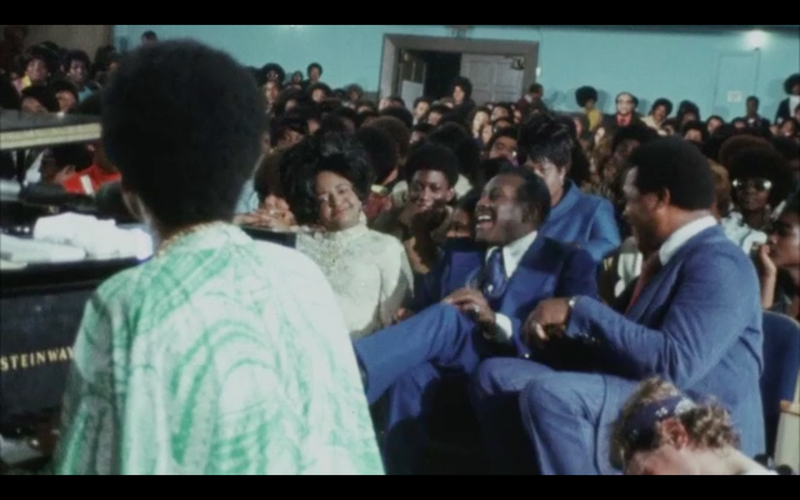 Forty-seven years later, this film is a testimony to the greatness of Aretha Franklin and a timemachine window into a moment in American musical and social history. Aretha Franklin was a giant of popular music and a global cultural icon. One of the best-selling musical artists of all time, with more than 75 million records sold worldwide, the undisputed “Queen of Soul” created an amazing legacy of more than six decades. She had sung before heads of state and foreign royals and gained admiration from fans, colleagues, and fellow artists across all genres. She is known all over the world simply by her first name: Aretha. Her vocal mastery and artistic excellence have been recognized numerous times throughout her distinguished career. Twice voted as the number one Greatest Singer of All Time by Rolling Stone magazine, Franklin is the recipient of the U.S.A.’s highest civilian honor, The Presidential Medal of Freedom, as well as an 18-time Grammy Award winner, and a recipient of the Grammy Lifetime Achievement and a Grammy Living Legend honor. Aretha was the youngest individual ever to receive the coveted Kennedy Center Honor; the first female inductee into the Rock & Roll Hall of Fame; the second female inductee into the US Music Hall of Fame; and an inductee into the Gospel Music Hall of Fame. Aretha’s gospel album, Amazing Grace is the biggest-selling album and the best-selling live gospel album of all time. 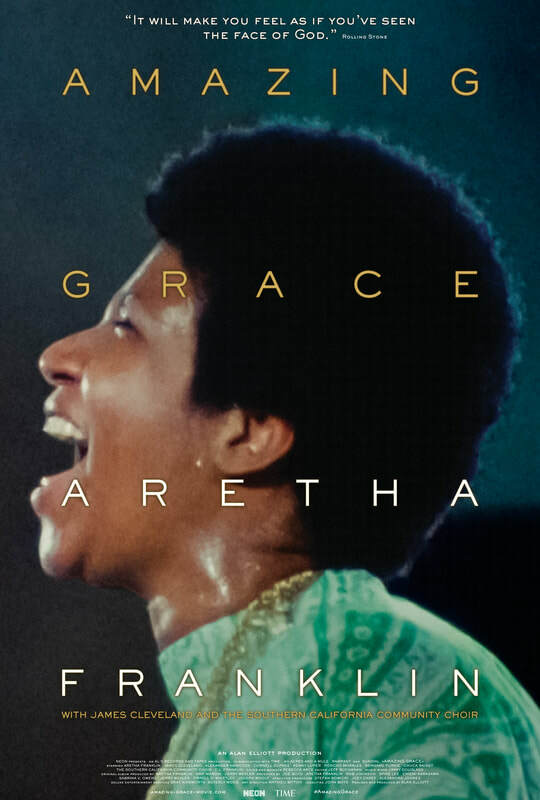 The album, Amazing Grace is enjoying a revival nearly 50 years after it was recorded, which follows the long-awaited documentary about the making of that legendary double live album, which opened to stellar reviews. CBS honored Aretha’s career on March 10th, 2019 with Aretha: A Grammy Tribute for the Queen of Soul. Aretha has been proclaimed internationally as “the voice of the civil rights movement, the voice of black America,” and a “symbol of black equality.” In 1968, her spiritually uplifting voice was heard around the world singing at the funeral of Dr. Martin Luther King, Jr., and in 1972 at the funeral of the Queen of Gospel Mahalia Jackson. Aretha’s acclaimed voice was declared a “natural resource of the state” in 1985 by the Department of Natural Resources of the State of Michigan. Aretha would later reach a milestone in her historic career by singing at the first inauguration of President Barack Obama.